The history of the bicycle has to include the influence of the French bicycle industry which has now spanned three centuries and seen two booms and is still relevant in the 21st century; and not just for the “Tour de France" bicycle race. French initiative can be traced back to the Parisian coach building family of Michaux who were amongst the first to put pedals and cranks on an enlarged front wheel with iron tires, way back in 1860, in collaboration with their mechanic Pierre Lallement. Production of these crank-and-pedal driven velocipedes took off so by 1865 the firm was selling 400 velocipedes a year. Once the Velocipede went on sale in the U.S. Product reached 200 units per day by 1868. The wood and iron construction of these machines meant they were heavy and hard on the rider, soon earning them the sobriquet “Boneshakers”. With the Franco-Prussian war erupting in 1870 the next advancement in bicycles came from Great Britain where Coventry Sewing Machine Company were building Michaux velocipedes under licence. 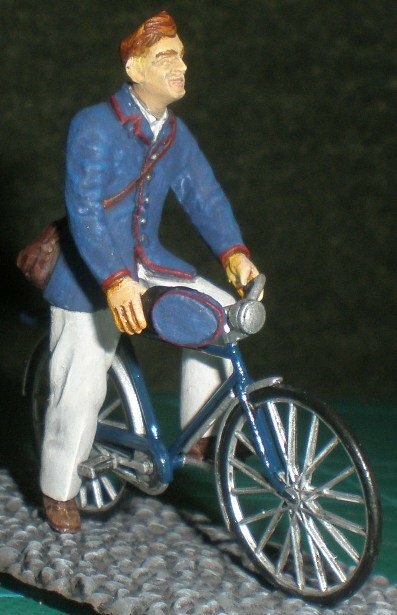 John Kemp Starley came up with an altogether new bicycle which came to be known as the Starley "Rover" safety bicycle. It was such an improvement that Starley became known as the father of the modern bicycle and the design was copied all over Europe. In some East European countries the name Rover actually came to mean bicycle just as Hoover is a general term used for vacuum cleaners. This relatively inexpensive form of transport became popular with young men and created a boom in sales. Bicycle races were soon flourishing and bicycle magazines sold thousands of copies per week. This sowed the seeds for a post war rebirth of the French bicycle industry. Paul de Vivie bought an ordinary bicycle and was so taken with it he sold his business and moved to Saint-Étienne, where he opened a bicycle shop selling imported bicycles from Coventry. He also set up the magazine, Le Cycliste. By 1889 he was selling his own brand of bicycles, La Gauloise. As bicycle design polarised around equal sized wheels front and rear, a chain crank and pedals driving a chain ring on the rear wheel, every day working bicycles started to look rather similar. So much so that by the 1930s, from a distance and without makers logos, a Sunbeam & Bianchi look identical and both were being sold all over Europe. Our model could easily be either of these to brands or any of several other French brands too. The list of French bicycle firms is long and includes illustrious names like Michaux, Hurtu, Gitane, and Renault. 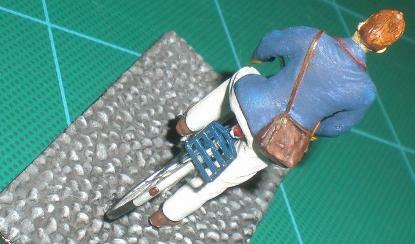 Ian converted the Tamiya German cycle troops set to create a French postman for an IPMS Stafford model display. The conversion was mostly straightforward with the use of milliput and sanding/recarving of the kit parts. 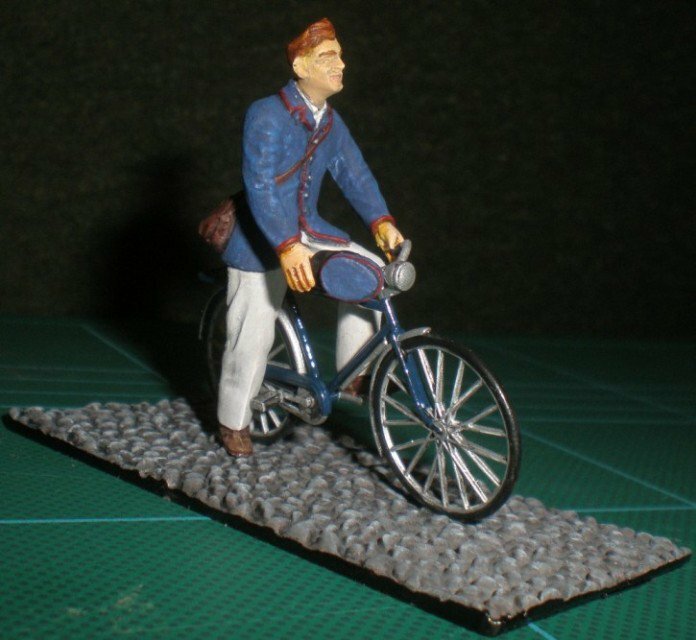 It is painted with Acrylic hobby paints from the Art-deco range for the figure as well as Humbrol enamels for the bicycle itself. 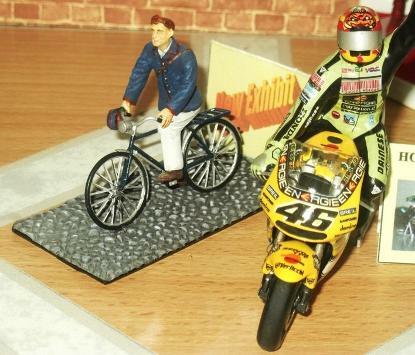 The difference in scale size can be seen in the photo' of the postman along side a 1/24th scale motorcycle.